Fewer than half of us recycle at the office, according to a 2008 Harris Interactive and Randstad USA poll. One way to fix that, suggests harvardbusiness.com’s Senior Editor Katherine Bell, is for companies to join a small but growing trend: installing tiny wastebaskets for non-recyclable trash and making workers empty them into a central dumpster. 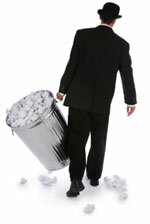 The idea, first used in 1993 Ontario offices, is to make us think twice before tossing out trash. At California ‘s Sonoma State University , recycling rose by 55%, or nearly 90 tons, in 2006, as people put cans and bottles in their proper place instead of in newly installed five-inch-tall bins. By Jacob Stokes, Business Week, August 11, 2008.